We have been asked to review two gaming magazines for a brief in interactive communications. I have chosen to review the Christmas 2012 edition’s of Edge magazine and GamesMaster magazine. I’ve selected these two because they aren’t console specific so there is no favouritism towards any console which I think will benefit the comparison. I will start by talking about the look of each magazine and how that appeals to there target audience and then move on to the writing styles of the magazines. 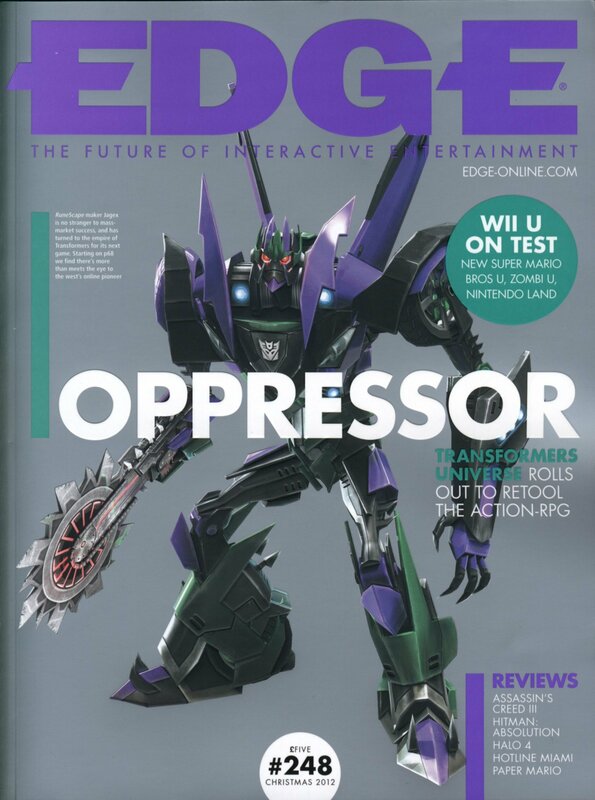 The first magazine I’m looking at is edge magazine, it has a very different look to your usual gaming magazine. When you initially see it on the shelf you may not even know it is a gaming magazine, it’s much more understated compared to others. You expect to see bright colours, advertising, lots of gaming pictures and often free stuff, edge doesn’t look like that at all. It has one picture in the centre of the page (In my editions case a transformer) and then has a little description of why it is there in very small print. It also has a list of some of the main reviews and that they are testing the Wii U, but that’s it really it’s very well laid out and not cluttered or too busy. It’s the same for the back of the magazine as well, where it’s just the back of the transformer with no text. In addition to the actually look of the magazine, it’s not the usual A4 size it’s a bit smaller which I think is done to make it look more professional and it succeeds. All of these clever little design features are on purpose to show that the target audience is for the more mature gamer and people that are not only interested in how good or fun a game is but how the game industry actually works. Once I opened the magazine I came across the contents page and I saw that it is split into 6 categories which are; Hype, Play, Knowledge, Dispatches, and Features and create. Each category contains different types of articles for example the Play section is the game reviews and the knowledge section has interesting articles about the gaming industry. As I got further into the magazine you notice that the text is very small for every article and the only time larger text is used is for quotes and headers or titles. This means the magazine articles can go into vast detail about their stories because they can get a lot of information on one page. It’s a very professional look and not like other gaming magazines because they normally go for a more visual look. The Reviews in Edge go in to a lot of detail and gives you a real picture of what the game is, they don’t just talk about what they thought about the game but they also talk about stuff relating to the game like the publisher and developer. In a review for ZombiU it seems to take you everything that could possible happen to you in the game, you know exactly what to expect from the game. It has a very mature writing style and reiterates the fact that this magazine isn’t for your average game enthusiast. The layout for them is most commonly one page of text and one page of images it’s a very neat and tidy look. At the end of each review it sums up the game in a few paragraphs and the then gives the game a rating out of 10, it doesn’t tell you any criteria used its just an overall score. Overall I enjoyed the magazine because of the detail it goes into in its articles. I also like the fact that it isn’t just talking about games but also stuff involving the game industry. An example of this is an article called pink vs. blue and it’s about the fact that woman in the gaming industry is at its lowest in a decade, you wouldn’t see an article like this in any other gaming magazine. One thing that can be a bit annoying is that the text is quite small and can be quite daunting when you go to a page with a lot of text. I’d give edge a 4.5/5 because of the sheer amount of content you get in the magazine. 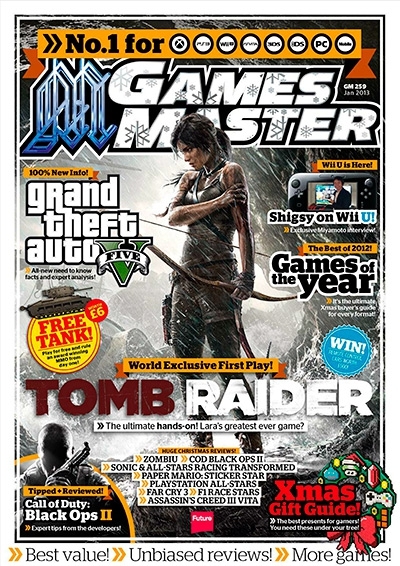 GamesMaster is the second magazine I’m reviewing, this is much more like the look you expect from a gaming magazine. Its bright, colourful, lots of gaming pictures, advertising, free stuff and saying that it’s the best gaming magazine out there. The magazine comes in a cardboard wallet and has a very cluttered look, you don’t know where to look first because there is a lot going on. It tries to tell you as much of the content as it can on the front cover, it has to do this because of all the similar gaming magazines its competing with, it needs to stand out. This also explains the bright colours, it claiming to be the best and the free gifts it includes, it’s to catch the eye of the buyer. The feature game for this edition is the new Tomb Raider game so the central image of the front cover is Lara Croft, the games main character with the line ‘World exclusive first play!’ in bright aluminous orange. It also mentions Black Ops 2 and Grand theft auto 5 on the front cover because these are very popular games people will be interested in. The back is just as busy as the front and it tells you some of the other reviews in the magazine that couldn’t fit on the front cover it also tells you about the previews and more detail about the free gifts. Once you open the cardboard wallet and get to the magazine it is very minimalist compared to the front cover of the wallet, it doesn’t need to have all the advertising because the consumer won’t see it until they buy it so it can look smarter. All this is done to appeal to the target audience of the magazine which I would say was teenage gamers who want to know if games are worth buying and the free gifts add that little extra enticement to compete with other magazines. GamesMaster has 4 main sections which are; Upfront this section has news, opinions and information about technology for example in my issue there is an interview with Shigeru Miyamoto the creator of Mario and he’s talking about the Wii U. There is also features which takes about the featured game in the issue, reviews which is all the game reviews and previews which looks at some upcoming titles. There are some other sections as well like fan base and cheat but they are smaller sections. GamesMaster looks like the typical gaming magazine with lots of visuals over actually content not to say there isn’t a lot of content though. A lot of the text is overlapped over images and in short burst I think this is done to not bog down the reader with huge articles that they look at and wont even bother reading. The reviews in GamesMaster are very much what you would expect from a gaming magazine, there are lots of images that take up more room then the actual review. I read the review for ZombieU like I did for edge magazine and it’s a lot briefer but still has good detail, it just tries to get across what to expect from the game and stuff that might happen to you whilst playing. It’s a much more broad review and tries to concentrate what the gaming wants to know about the game. When it comes to the scoring of the games there is 5 criteria and they give each criteria a score out of 100% and then an overall score out of 100% and then gives it avoid, try or buy. Overall I enjoy GamesMaster magazine I like the layout and style of it and has some interesting interviews with developers and Q and A’s. Sometimes there can be a lot of stuff on each page which can be a bit frustrating because you don’t know where to start. But there are a lot of interesting little things in the magazine, an example of this is a page at the back ‘hall of fame’ with the 10 best games for each console which is quite interesting to see. I’d give GamesMaster a 4/5 I think it’s a very good gaming magazine for the common gamer with interesting reviews and some cool articles.